Sadie Robertson is a motivational speaker, best-selling author and is one of the stars of the A&E show Duck Dynasty. She has an all-new 4-day devotional plan on the Bible app titled Live Fearless based on her book of the same name. It also features exclusive video content as well. Join Sadie as she will both inspire and encourage you, as each day she shares one of her favorite Bible passages, then challenges you to push through you fears and anxieties, to break into the life of purpose that God has for you. 1. Whose voice is the loudest in my life? 2. Whose lead is strongest in my life? 3. What's my idea of winning? Those are some tough questions that we need to think about for ourselves. And her faith as a strong, purposeful young woman, deeply grounded with God is so on point with this plan. She quoted so many Biblical scriptures like 1 Corinthians 15:57, Psalm 46, Revelation 4:8 and so I rated this five stars after its completion. 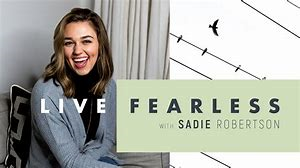 So, anyone who is going to fears or anxiety should definitely read this plan by Sadie Robertson. I also recommend that you purchase her book Live Fearless: A Call to Power, Passion and Purpose where she talks about inspiration for the younger generation who are holding themselves back through fear, anxiety and loneliness.